It used to be that you had to go to Mexico City to catch the best live music. Now, Guadalajara is a hot spot for some of the best bands and artists in the country, and indeed in the world. These are our favorite places to listen and watch. This one of the most important entertainment spaces in Latin America, located in the Metropolitan Area of Guadalajara. For almost 10 years, artists and musicians from all kinds of musical genres, from pop to classical, have performed concerts here. It has a capacity of more than 8,000 spectators and is the official headquarters of the International Film Festival in Guadalajara. This is, without a doubt, the most beautiful venue in Guadalajara, and has the best acoustics, thanks to its architectural design. 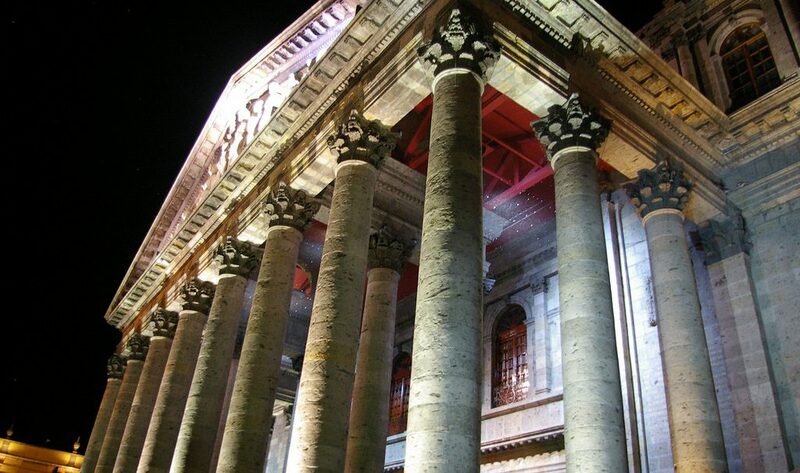 The most important artistic venue in the state of Jalisco, this theater was built in 1855. It is the house of the Jalisco Philharmonic Orchestra, the International Mariachi and Charreria Encounter, and the Ballet of the University of Guadalajara. There’s always something on, whether it’s a concert, an opera, classical ballet, a recital, or a play by a national or international writer. Originally this theater was the famous Cinema Diana, which was part of an urban project that included a business center, the Guadalajara Condominium, and a hotel, in one of the most traditional neighborhoods of the city. The cinema closed in 1995 and six years later it was taken over by the University of Guadalajara. Since then, artists such as Luciano Pavarotti, Baaba Mal, Kronos Quartet, Apocalyptica, Bobby McFerrin, Goran Bregovic, Lila Downs, Franz Ferdinand, Dream Theater, and Yann Tiersen have played here. The name of this venue derives from the initials of Vicente Fernández Gómez, a Mexican singer, and it’s located on his ranch. The main events are traditional Mexican music, but it also hosts sporting events and exhibitions. It can hold up to 40,000 people and has played host to some very popular artists from Mexico, as well as to enormous worldwide stars such as Ed Sheeran. This is a good place to come for free concerts during the International Book Fair in Guadalajara. Located outside Expo Guadalajara, the city’s main exhibition center, the venue has earned the approval of locals and foreigners alike. This is a small but very good place to listen to new bands in the city. As its name says, it is an independent forum: it’s a place to have a good time with your friends, where you can have a beer while listening to some new music. This little forum is especially perfect for listening to jazz, one of the musical genres presented here. They also put on some great plays with lots of personality.